Spoiler Alert: As one inevitably approaches his fortieth or fiftieth listen to the opening cut on The Hush Now's sophomore set -- because it is that good -- the revelation strikes that the pulsing flow of the lyrics to "Contrails" suggests Chuck D's in the greatest hip-hop song of all time, "Don't Believe The Hype" ("they can't come on and play me in prime time..."). That tangent aside, vocals and keyboard tower over the other elements of "Contrails," and we wish someone had depressed the "Superchunk Guitars" button during the mixing session for that track. We can't help but wonder if The Hush Now's songwriter and guitarist Noel Kelly pondered hard over the decision and chose the lighter (and probably more radio-friendly) touch as part of an effort to spread the band's musical wings more broadly on Constellations, The Hush Now's wonderfully realized new collection. Its 10 songs are rife with arrangement and production surprises that increase the dimensions of the band's already formidable amalgamation of British(-style) guitar pop inflected with '70s AM Gold harmonies. Not the least of these surprises is the stirring bridge in "Contrails," featuring -- E.L.O.-style, and we believe from the mouth of Mr. Kelly's brother -- an operatic vocal solo almost mystically summoning a final giant chorus. Said chorus is further punctuated by a bright trumpet line that charts the front end of a nice contrast to the darker, more bouncing title track that follows. "Constellations" noticeably percolates with similar energy to "Traditions," a highlight of the band's first long-player [live clip of the former track here]. There's a surprisingly soulful horn solo in "Thorns," as well, floating above a spray of delayed guitar that recalls The Cure's Disintegration or The Kitchens Of Distinction's finer moments. The album's first rough edges don't appear until the crackling opening of "All You've Said And Done," although here again the vocals tamp down the big guitars once the lyrics kick in. Later, that song dissolves into 90 beautiful seconds of strings and feedback and accordion that is among the most impressive things to spring from the mind of Mr. Kelly so far. Then "Fireflies" opens with banjo. Such production flairs could easily present as kitschy, pile up and cloud the underlying music, but Kelly and his cohort ably massage them into Constellations so that nothing sounds tacked on at whim. Such remarkable facility with arrangement and production may be the band's biggest surprise of all. Beyond the broader palette, the new collection isn't that different a beast from The Hush Now's solid self-titled debut (both created with the production assistance of The Mighty Lemon Drops' David Newton). And so Kelly's five-year plan, first detailed here, pushes on. The first single from Constellations, "Hoping And Waiting," is already scratching certain radio charts. The Hush Now's biggest challenge at the moment may be securing a lead guitarist to promote the record this fall, as its most recent six-string-slinger left the fold earlier this month as live commitments are starting to fall into place. 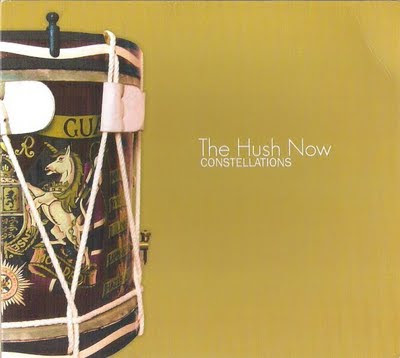 However, for a band whose history encompasses a car crash and a flood, fans know it is unwise to count out The Hush Now. Constellations will be self-released by the band Oct. 13.